SAN FRANCISCO, California, January 24, 2019 (ENS) – When faced with a challenge, the city of San Francisco rededicated itself to recycling. One year ago, when China announced it would no longer accept shipments of recycled materials from foreign countries, the world lost its biggest customer for bales of recycled paper and recycled plastic. This created a buyer’s market, and paper mills and manufacturers receiving recycled materials now demand bales that contain almost no impurities. • Strengthened relationships with domestic and foreign buyers of recycled materials and developed new markets. • Retooled Recycle Central, a 200,000-square-foot Material Recovery Facility on San Francisco’s Pier 96, including installation of a $3 million storm water reclamation system. 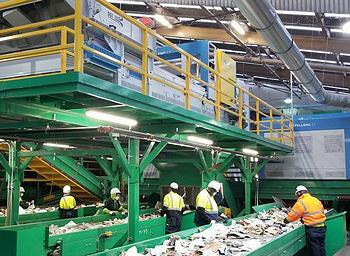 After the $14 million upgrade, the recycling facility now houses seven high-speed, computer-controlled optical sorters. • Constructed a state-of-the art organics transfer station to expand San Francisco’s industry-leading curbside composting collection program. • Delivered more than 100,000 larger recycling and smaller landfill carts to residential properties across the City. This Recology program has been especially successful. New larger recycling bins and smaller refuse bins for residences have encouraged recycling. Recology updated its lid stickers, which use pictures to show what goes where, and applied the stickers to 313,000 carts and containers in San Francisco. 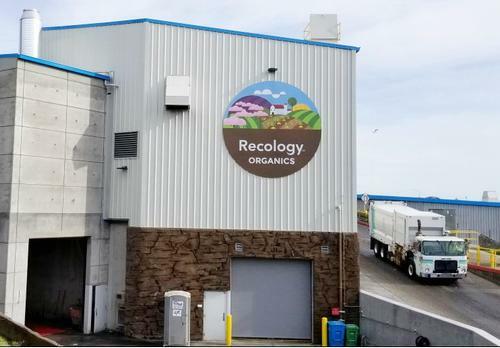 “This program has resulted in the largest decrease of landfill tonnage and increase in recycling and composting since the inception of the Fantastic 3 program in 2000,” Recology says. These initiatives allow Recology to better sort materials and reduce contamination, resulting in higher-quality bales of finished recycling. Producing high-quality, bales enables San Francisco to market its recycled materials, which helps fund the city’s curbside collection program. Curbside composting collection saves landfill space, sends nutrients to local farms, reduces greenhouse gas emissions, and creates three times more jobs than landfilling. San Francisco has just hit the milestone of composting two million tons of organic materials, and on December 19 the city celebrated the opening of the West Wing, an extension of the Transfer Station. The $19 million investment gives San Francisco the capacity to increase the amount of food scraps and yard trimmings collected and transferred to composting facilities from 750 tons to more than 1,000 tons per day. Other facility improvements completed in 2018 include installing the largest privately owned solar array in San Francisco, supporting the city’s goal of reaching 100 percent renewable energy by 2030. Recology also installed a new water reclamation system that reduces water used for truck washing by 80 percent, saving thousands of gallons a month of drinking water. • In August Recology launched Better At The Bin, an citywide initiative to encourage all to become better recyclers and smarter consumers. The microsite includes key facts and statistics, such as that fact that globally, we consume 500 billion plastic bottles a year. It features high-quality, engaging videos that highlight solutions. And it offers lists of simple actions we can all embrace to reduce trash. For instance, switching to a metal water bottle saves $258 a year compared with buying single-use plastic bottles. Other simple steps include keeping liquids and food out of recycling bins and refusing single-use plastics. Recology created the Better At The Bin recycling truck with San Francisco muralist Sirron Norris and will send the truck to many schools and special events in 2019. Recology posts timely, relevant information on social media platforms including Facebook, Twitter and Instagram.